Along with everyone else in America, I decided to organize my house in January 2016. Once and for all! (Okay, maybe it was the 3rd pregnancy nesting kicking in.) 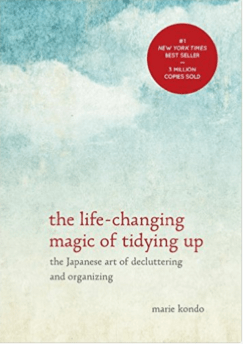 Having heard about the Marie Kondo hype, I picked up “The Life-Changing Magic of Tidying Up: The Japanese Art of Decluttering and Organizing” at the library. Mostly I was curious: what’s the big deal with Marie Kondo? But, I also felt like I was always getting rid of stuff. How could I always be getting rid of stuff and still have extra stuff and clutter around? I was tired of being a “stuff manager” and wondered if she’d have a more permanent solution. 2019 Update: We moved into a much bigger house, yet still use a lot of her tidying strategies, even though I think some of her philosophies are a bit wonky. And yes… of course I watched the Netflix show. 😉 If you’re trying to get motivated to declutter, you should definitely watch it! Marie Kondo did have a solution! Her book is a quick and read, and while some of the stuff sounded whacky, a lot of the principles of the Marie Kondo method made sense to me. So I decided to try it. 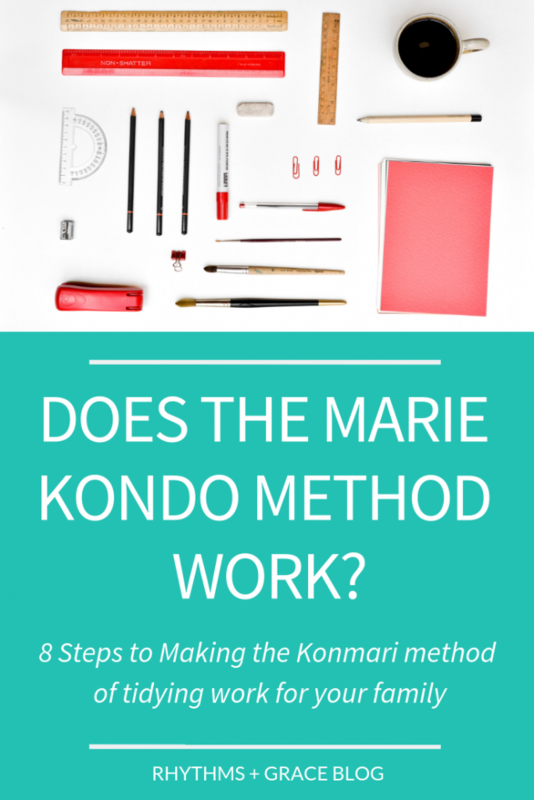 Here are some of the main points from the KonMari method if you want to try it for yourself! 1. Get a Bigger Why – WHY do you want to declutter? Why even try to declutter and tidy? 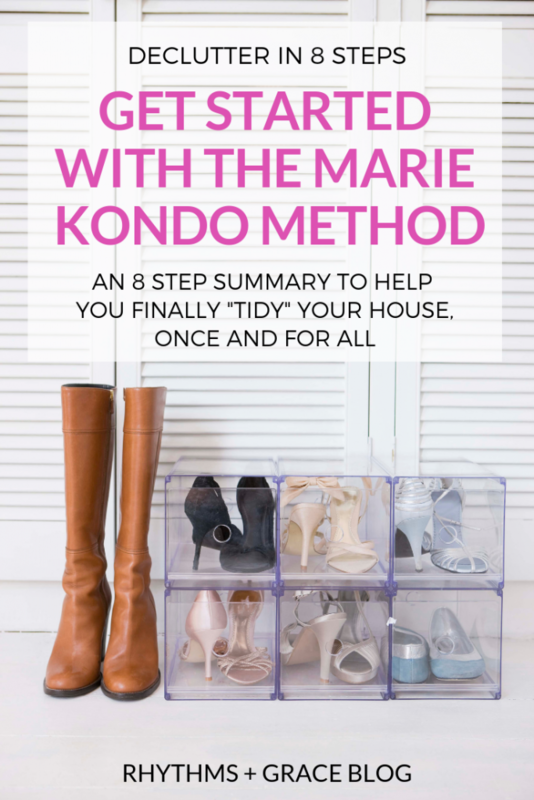 Kondo argues you have to have deeper motivation than merely having a clean house. She says “tidying” is life-changing because decluttering your space leads you to declutter your mind, which leads you to enjoy life more and become more productive at what you truly love. My “bigger why” was being tired of spending so much of my time at home trying to manage stuff. 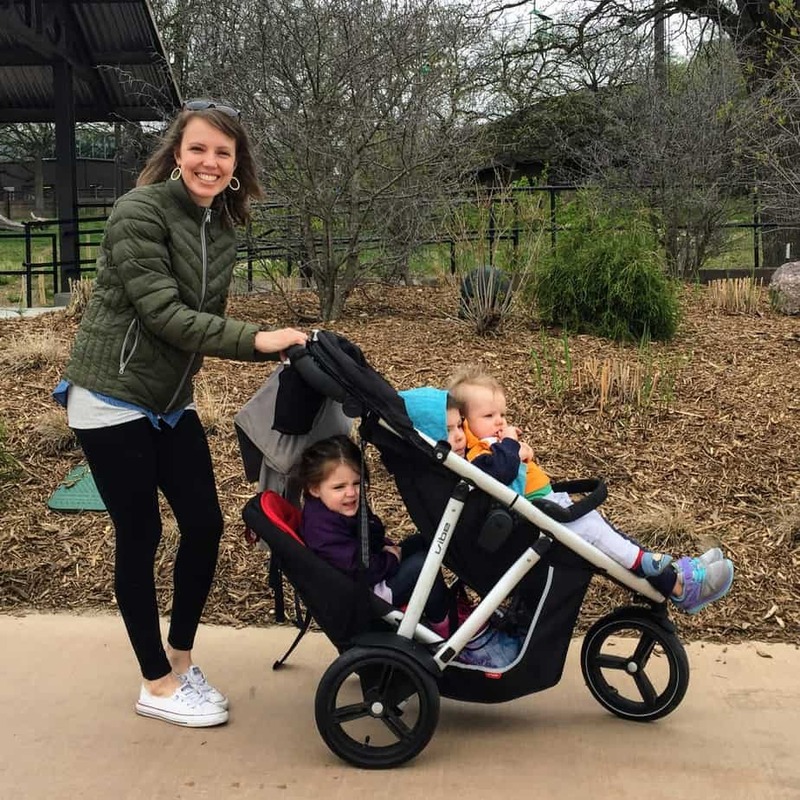 I envisioned less time picking up, cleaning, thinking about what we needed and didn’t need, selling or donating unnecessary stuff, and more time being present with my kids in these little years. More time and mental space to write and take care of my family. Of course, the other solution would be to just not care about the clutter… 😉 One, I’m guessing Marie Kondo would find unsatisfactory. 2. Tidy Your Entire House All at Once and Don’t Stop Until You’re Done! I actually agree with this!!! Especially after experiencing it myself in 2016, and then watching the show in early 2019. If you pile ALL OF YOUR CLOTHES IN ONE GIANT PILE ON YOUR BED, and sort through them one item at a time, you will probably never be in this situation again. Because from that moment on, you will have a way better picture of what you have, what you need, and what you love. 3. The only Rule for Keeping Something: Does it spark joy? Does it “spark joy?” Kondo says that while all the arbitrary “rules” you hear from organizing professionals are well intentioned – get rid of one thing for everything you bring in the house; throw out 10 things a day; give away items you haven’t used in 6 months; etc… – they’re all mostly unsustainable and unsuccessful because you still bring home new stuff and haven’t changed any habits. Instead, she says, pick up every single item in your house, one by one, and ask yourself, “does this bring me joy?” If yes, it stays. If no, it goes. At first, I thought this was WHACK. She has an answer for that… appreciating the usefulness of an item, like a diaper, is another way of it bringing us joy. #Bam #Konmaried So, I bought in. I tried it. I picked up each shirt and book and old photograph and asked myself: does it bring joy? If not, I gave myself permission to toss it. This actually turned out to be much simpler than all other ‘rules,’ for whether or not to keep something. And it’s still the rule. Now, I basically throw out everything that is not useful or joy producing. Oh, and Kondo says no I’m-sure-I’ll-use-this-someday pile allowed. This one was probably the biggest ‘ah ha’ for me. Marie says (we’re on a first name basis now…) that your possessions reflect your state of mind, and that we hold onto things for 1 of 2 emotional reasons – fear of the future, or to preserve the past. There were things in our house that felt in-the-way, or useless, but for some reason, I couldn’t let go of. Mostly I realized they were things that had been given to us and I felt guilty getting rid of them. She gives “permission” to let them go after they’ve served their purpose. It’s truly the thought that counts. That person found joy in giving it to you, you had joy in receiving it, but now it’s no longer useful for you. So you can throw it out. You will be in shock when you see how much of one item you have – the shock helps give you permission to get rid of things you don’t love. It’s easier and more satisfying to cleanse out one whole category at a time. Then it all goes back in one place, rather than different places all over the house. You will always know where something is. Rather than having to look in each closet and by each door for a specific pair of shoes, all your shoes will be in one spot. It’s easier to tidy and put things away. No more random clutter because everything has one place. Mostly, we’ve abided by this in our home. Now that we live in a 3 story house, I do keep some things on each level… like extra toilet paper rolls. But most things have one spot in our house. It DOES make tidying easier! Marie says, that when you’re done purging a particular category, you should first throw everything away that you’re going to get rid of. Then, go put the stuff you’re keeping back. She says that if you do her method, you will naturally change your habits. If you take the time and energy to sort through every single thing in your house, in every category, and choose whether or not to keep it base on whether or not it brings you joy, then you find only one place for each item… you will never go back. In the book, she explained her 5 minute routine when she gets home. She puts her shoes and coat in their appropriate places, completely empties her handbag, puts all those things in their places, thanks all her objects for doing their job, blah blah blah. It was obvious to me from this paragraph that she didn’t have kids at the time she wrote it. I mean, maybe it’s just us, but we enter the house like a tornado: coats and shoes flung everywhere; mom and toddlers racing to the potty; everyone seems to always be starving and thirsty and crabby; and do you know how long it would take me to empty every single item out of my ‘handbag?’ Plus, what if I want those 3 month old cheerios at the bottom of my purse for a snack when I’m out tomorrow? To KonMari or Not To KonMari? All in all, I would say I’m a fan. I think it basically ‘worked.’ It was easy to get rid of that extra stuff I was saving out of guilt once I felt like I gave myself permission, realizing my relationship with people wasn’t based on gifts we’d given each other. Overall, I am more careful about what I buy and bring home. I spend less time putting crap away in general. You can pin this. You’re welcome. Don’t tell Marie. 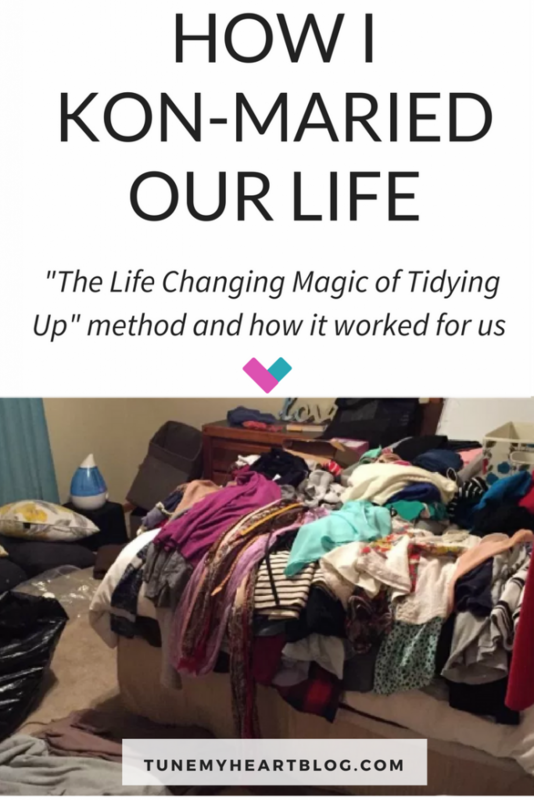 When I initially Konmari-ed everything, I was wrong about 2 things. I thought that things would feel empty. Like, I would throw stuff away and then want more to replace it. In fact, it was the opposite. I realized how much we had that we didn’t use or need. AND, I am way more careful about what I buy. Buying less means spending less. I thought our house would always be clean once I did this. Nope. It gets plenty messy all the time. (Ahem – see above pictures.) BUT, it’s messy on purpose. Because it’s being used. Meaning, it’s messy because my kids are playing with toys they like. Or because the dinner dishes are everywhere. Or because I was actually using the sewing stuff I kept around. 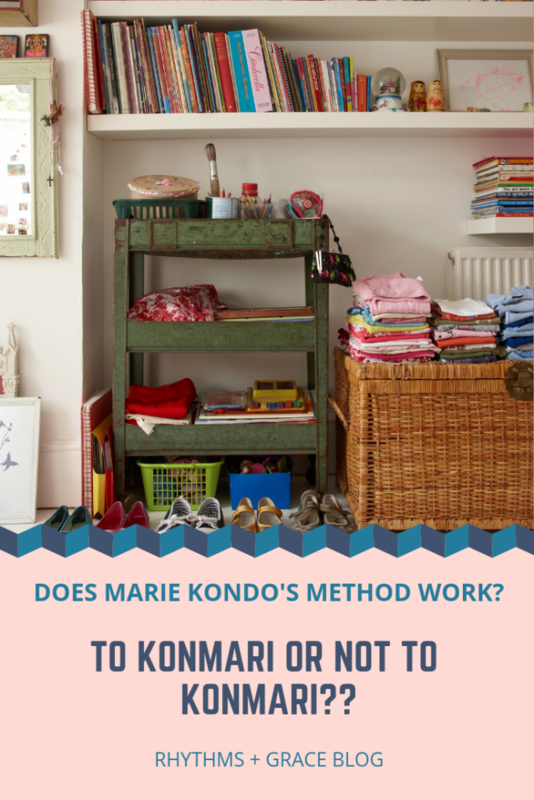 Bottom Line: Does the Konmari Method Work? The lady knows her stuff. Since it’s 2019, you can now go watch her Netflix documentary show and you will feel SUPER motivated to get going!! You can also jump into my RHYTHMS + GRACE EMAIL COURSE that’s all about creating rhythms and routines in your everyday mom life! Basically, although some of the book is weird, I like a lot of her ideas about how to get stuff truly organized “once and for all.” And if you feel tired of being surrounded by clutter, or never quite feel like you can have a system down, I definitely believe that she could basically help anyone get organized. But, I differ with her on some things. Her emphasis on tidying doesn’t seem to leave much room for life. Life happens. Houses are for being used and they get messy and life goes on. You can always pick up your crap later. So, have you read it? Or any of her other books? Or watched the show? Have you tried tidying up? Are you going to? Agh! Crafts! I didn’t have a great way to decide. I just realized that I don’t craft that much. So I didn’t keep a bunch of random stuff. We don’t have a ton of storage space either. I could picture keeping more when we’re in a different season of parenting – where our kids are older and enjoy more unsupervised crafts. I did keep paints, paper, coloring stuff, etc. for the littles. Then I kept a few of my FAVORITE fabrics that I know I would use if I pulled out my sewing machine. I kept my sewing machine, thread, needles, etc. But basically got rid of everything else… and haven’t missed it! 🙂 If you’re a BIG crafter and love crafts, obviously that choice might look different for you, but I hadn’t used most of it in over a year (and probably won’t with soon-to-be- 4 kiddos under 6. haha!) If I ever get back into crafting, I can acquire favorite supplies at that point. ok question! I haven’t read the book yet so maybe that will help (just ordered it on Amazon!) butyou said you had craft supplies. How did you decide what to keep? I have so many random little crafting objects for projects. I feel like I’d keep everything(but don’t really want to). What did you do? I have been curious about the book also. I enjoyed your review. 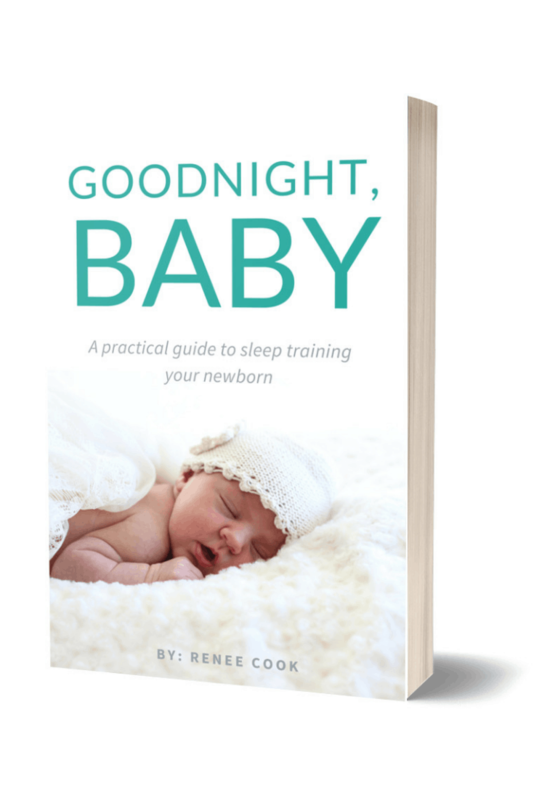 Your writing style is informative, and still light and fun! You did a write-up on her book perfectly and I feel nearly exactly the same about what you think. I like your life philosophy too – those babies stay little like a milisecond. ooo that’s really helpful!!! i was actually just wondering about that 🙂 I’m 31 weeks pregnant with my 3rd. 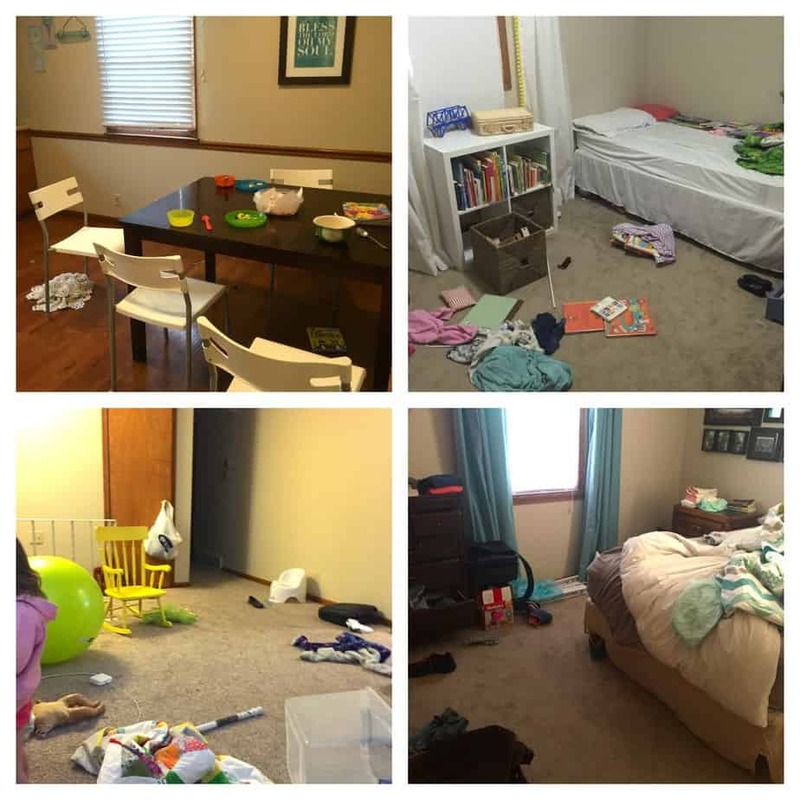 with a couple toddlers running around, a clean house is just not at the top of my priority list. so that’s encouraging 🙂 thanks! I am currently konmari-ing my home. I’ve listened to her first book and partly through Spark Joy. In Spark Joy, she emphasizes not to assume you have rebounded just because your home is a little messy. You just haven’t put things back in their place and since they all have a home putting them back shouldn’t take very long (30-60 minutes). I find this helpful and a relief and hope you do too. You cam also listen to the audiobook Free on Hoopla! agree! that was my biggest takeaway too… and my husband and I have been jokingingly thanking our things ever since. haha! Read her book and found the idea of letting things go that have served their purpose helpful. She was unintentionally humorous about speaking to your things and thanking them. I too like organizing and decluttering, it centers me. I haven’t read the book yet but I went through all my clothes at the beginning of the year and donated a bunch of stuff and organized the remaining things using her method (found it on pinterest) and it has made a huge difference! Also, giving yourself permission to let go of things is a game changer. Just reserved a copy at the library!